The HP Elite X3 is shaping up to be the most interesting and exciting Windows Phone since, well, ever. Earlier this morning, we passed along the latest specs for the high-end handset. Let's review them as there are some changes and additions. There is the 6-inch OLED screen featuring a 1440 x 2560 resolution. That works out to a pixel density of 490ppi. Under the hood is the Snapdragon 820 SoC, containing a quad-core CPU and the Adreno 530 GPU. 4GB of RAM is inside, along with 32GB/64GB of internal storage. Those seeking additional memory will be able to access a 200GB capacity microSD slot. The Elite X3 will be equipped with Windows Hello (iris scanner) and a fingerprint scanner as well. There is support for Qi wireless charging and dual SIM capabilities. A 16MP camera is on the back and an 8MP front-facing snapper handles selfies. Included is a USB Type-C port, and the phone has an IP67 certification. That means it is protected from dust, and can be submerged in up to 3.2 feet of water for as long as 30 minutes. Measuring just 7.8mm thick, the handset tips the scales at 190 grams, and the STD810 military MIL-rating means that the phone is protected from 1-foot drops. Windows 10 Mobile is pre-installed. And we have just learned that the Elite X3 will have a 4150mAh battery, keeping the generator humming for a long time. Some new images of the handset have surfaced, and can be found in the slideshow. We should point out that the prototype that allegedly will be shown at MWC does not include the fingerprint scanner, even though the feature is still scheduled to be included on the production version of the phone. And with support for Continuum, the Excite X3 will drive a laptop called the Mobile Extender. This is a 12.5-inch screen with a built in battery and a QWERTY keyboard. The laptop connects to the phone via Wi-Fi or the USB-C port. Can this one phone put a charge into a platform that has been moribund until now? Can the beastly HP Elite X3 singlehandedly put a cfharge into Windows 10 Mobile? Too much pizza on your cheese! Nope, they don't have any apps, they just made an empty device for style and to make up a number. No apps here......! they don't have any apps??? what apps you need? Like 10 000 fart apps, 5 000 police siren apps, 5 000 ambulance siren apps, etc. Bring it on I'm definitely getting one. So it's essentially what the 950XL should've been. Interesting..
From what's been said and seen concerning this handset so far, it seems incredible. My interest is definitely piqued. 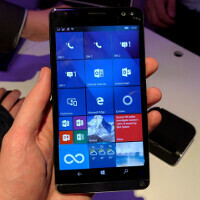 Hopefully, handset will give a much needed boost to the Windows for Mobile platform. It's definitely looking like this will be my next Windows handset. Great specs ruined by running Windows. It would be better if it had vanilla android as well right ? Android don't deserve hardware this descent, Samsung and LG is doing an alright job with the stutter bug-laden device. HP makes Windows devices, why corrupt beautiful h/w with Android ? Can't 6to see the official reveal of this phone. If they really out some effort into the camera this will no doubt be the best Windows phone on the market. Very interesting. I think that the continuum feature with a laptop is much better than having to connect it to a display and have a wireless keyboard and wireless mouse with it. The specs are incredible, and while the design is lackluster, that can certainly be looked past. This is a power users dream, even if Windows 10 mobile is a bit sketchy. Needless to say, this puts the new Lumia's to shame. Coming from a Note 5 user, I think it's time to give Windows Phone a shot. I can't wait to hear more about that 6 inch oled screen. Don't get me wrong, the Note 5 screen is great, but IMO it's just a bit to small, and I'm sick of using a zerolemon battery case just to make it through the day. I'd say the only thing missing is a stylus. Other than that, it's perfect. I'm just stunned at everything HP decided to cram into this phone! My only wish is it does support surface pro pen and its functionality.. I want this. I don't use Snapcrap and I won't install 1.5 million apps in my phone. LOL @ Snapcrap LOL I agree totally with your sentiments !